Today, March 25, 2015, is the United Nations International Day of Remembrance of the Victims of Slavery and the Transatlantic Slave Trade, whose theme this year is Women and Slavery. As a scholar working on the history and the public memory of slavery days, like today are important landmarks to study how the slave past is remembered and reconstructed today. This year is particularly important, because the date will be marked by the unveiling of The Ark of Return, an UN permanent memorial to honor the victims of slavery and the transatlantic slave trade located at the Visitors Plaza of the United Nations headquarters in New York City. The concept of “return” explored in the new memorial is not new. It is present in existing slave trade heritage sites including the (alleged) “door of no return” of the House of Slaves in Gorée Island (Senegal), and the doors of no return found in slave depots like the Elmina Castle and the Cape Coast Castle, in Ghana. Unfortunately, the UN video promoting the new UN memorial repeats again the historically inaccurate statement that millions of slaves were shipped from the Gorée Island in Senegal. The inaccuracy of this statement that is at the heart of the concept of the UN monument can be easily verified by any student of slavery just by consulting the Transatlantic Slave Trade Database. 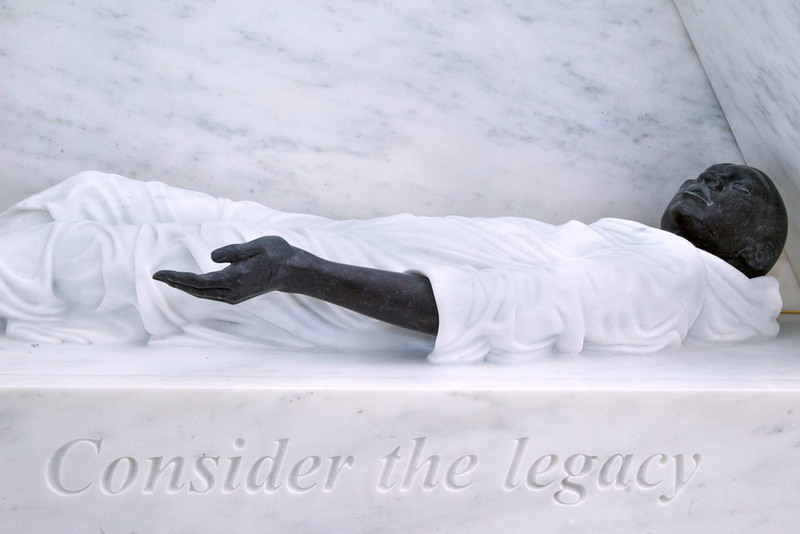 The idea of return has also been explored in numerous memorials and monuments commemorating slavery and the Atlantic slave trade around the world. Among these monuments is “The Gate of No Return” in Ouidah (present-day Republic of Benin). During the era of the Atlantic slave trade, Ouidah was the second largest slave port, after Luanda in West Central Africa. Its “Gate of No Return” was unveiled in 1994, as part of the then recently launched UNESCO Slave Route Project. Some years after the unveiling of the “Gate of No Return”, another similar monument commissioned by the Catholic Church was created near the “Gate of No Return” and then a third monument titled “Door of Return” along with a small museum was unveiled on the beach of Ouidah, as part of an NGO initiative. The three monuments form a complex (and controversial) set monuments memorializing slavery and the Atlantic slave trade in Ouidah. By emphasizing intriguing relations and by sending contradictory messages about the Atlantic slave trade past to the hundreds of African diaspora tourists who visit Ouidah every year, these monuments shed light on how problematic the process of memorializing slavery in the public space is. I did not visit the UN’s Art of Return yet. Although the picture below does not show the memorial in detail, from its title and from the other pictures I was able to see on the Internet, the memorial reproduces the idea of spiritual return which was already explored in the West African initiatives mentioned above. Apparently, the UN Ark of Return aims to be in dialogue with Gorée’s Door of No Return. In addition, it is worth mentioning that the UN memorial was conceived by the architect Rodney Leon, who also designed the memorial of the African Burial Ground in New York City. The two memorials certainly have several features in common, especially regarding the format containing large geometrical structures symbolizing passages intended to engage the visitors. However, designing the UN’s memorial may have been easier for those who conceived it. Unlike the African Burial Ground, a sacred site where African and African American men, women and children were buried, the UN memorial is not located on an actual heritage site of slavery. As a result the memorial’s construction was not highly debated and contested by the members of the black community in dialogue with the city’s and federal’s authorities, as it was the African Burial Ground Memorial. At the same time, the comparison between the two monuments can reveal interesting elements on how the memorialization of slavery and the Atlantic slave trade is being officially oriented. As the official agencies like UN and UNESCO choose to highlight particular elements, instead of others, the danger is to erase the multiple and dissent voices that form this rich mosaic that is the public memory of slavery. I am a cultural historian of Latin America and the Atlantic World. I am Full Professor in the Department of History at Howard University. My work explores the history and the memory of the Atlantic slave trade and slavery and their social and cultural legacies. I am particularly interested in the public memory, heritage, and visual culture of slavery. To know more about my research and publications, visit my personal website or my webpage at Howard University.